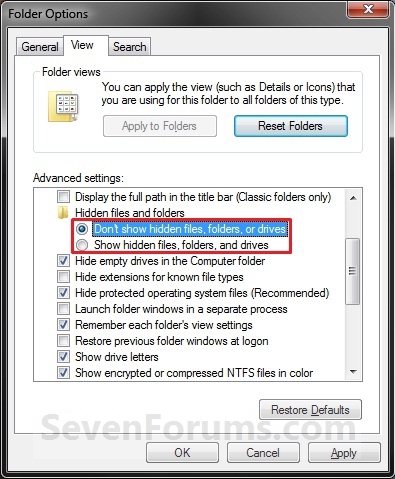 Can I hide and unhide one folder or drive at a time in windows 7? How I can do so? Hi friends I want windows 7 to hide and unhide a particular drive or folder for me so that I can hide a particular folder even when I want to see or use some other folder which is also hidden at the same time? And also explain me how? Procedure to hide taskbar and start menu when opening Â“MY COMPUTERÂ” in windows 7 professional? Re: Can I hide and unhide one folder or drive at a time in windows 7? How I can do so? hi i am hoping this might help you..
step 1: right click on the folder or file you wnat to hide and in the menu that appear click on properties. step 2: in the properties windows you will see hidden written and next to it a box.click on the box to check it. step 3: now you will see that the file or folder is partially hidden depending on the file and folder options you have. step 4:now go to start and in the search proggram type 'Folder Options' and press enter.the folder options box appears. step 5: click on view in the folder options and under hidden files and folder :click on dont show hidden files and folder.click on apply and click on ok.
also to see it you again go to folder option box and under view click on show hidden files,folders and drives. Click Appy and Ok Button. after install it u can set ur password to lock ur file or folder. &when u want to use one file go to the shortcut of IObit Protected Folder open it. Yes you can Hide and unhide your files and folders in the windows OS or windows 7 OS in such a way that there not be any folder visible if you hide it in your system so it is easy to do so and go to the control panel options then you can find folder options and also you can hide and unhide the folders there by choosing the option you want. Friend, you can hide the folder by right clicking the folder and select Properties. There at the bottom you can view the Hide folder option. You can mark or tick it to hide the folder. To un hide folder go to control panel and go for Folder Options and un hide it. You can also go for Organize and then go for 'Folder Options' and select 'View hidden folders'. Yes you can hide and unhide the drive as well as the folder in the windos. Download Folder hider from the internet. You will have to put a password in it. Than select the drive or the folder which you want to hide. Now Click on “View” Tab. A) Right click on the file or folder, and click on Properties. D) In Folder Options, make sure that Don't Show hidden files, folders, and drives is selected (dotted). 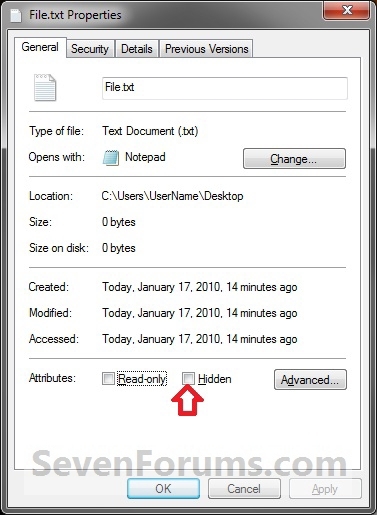 NOTE: This way you will be able to see the hidden file or folder to be able to unhide it. B) Right click on the file or folder, and click on Properties. 3) Apply the setting ..
And your file will be hide..
3) Click on the 2rd tab on the top of the open application " View"
4) after clicking on that many new option will be open below , In those there will a option " Show hide files"
1.click on the start button and then click on control panel. 2.click on appearance and personilization option. 4.click on the view tab in the folder options window. 5.in advance setting: section, locate the Hidden files and folders category. 6.choose the do not show hidden files and folders radio button under the hidden files and folders catogary. 7.click ok at the bottom of the folder option window. 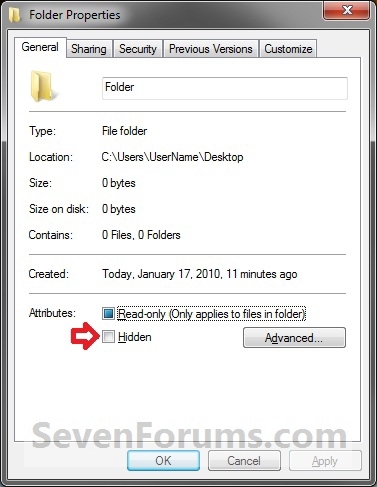 8.from now on no files and folders with the hidden atrribute turned on will display in search or folder view. IT IS VERY EASY TASK TO PERFORM TO HIDE AND UN HIDE THE FILE OR FOLDER. >> Right click on the folder or file you want to hide a drop down list appears. >> Now choose properties from here. >> A new window will appear. >> In this new window you will get attributes at the bottom here you have to choose the hide option below read only. SO DEAR THIS IS THE PHENOMENON TO HIDE A FOLDER OR FILE. >> Open the my computer the window will appear. >> Here you see on left top organize. >> A drop down list appears from the list you have to choose folder and search option. >> A another option box will appear from here you have to choose view. 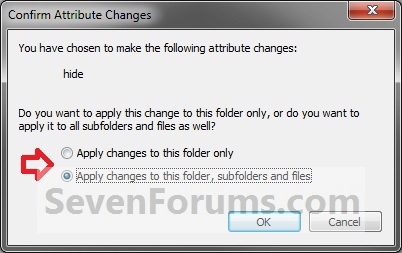 >> Here below you can make changes to hide or un hide the folder. Right click on the folder which you want to hide then click the properties. Open the property windows, the check the hidden check box..
Open the My Computer and then click the Tools menu and click the Folder Option. Open the Folder Option window, click the View tab. In the view tab, In the Advance setting go to the Hidden file and folder..
Click the radio in the front of Do not show the hidden file to and folder to don't show hide folder and show the hidden file to and folder to show hid folder. Certainly, you actually will surely Hidden the particular versions as well as files with windows 7 doing work system. You need to Right click on the particular File and get to click on the particular Qualities choice, you then currently have have to click on the particular Disguise choice and get to click on the particular Employ choice and get to click the OK option. Now the directory will get dis sappers this means you actually have completely finished the particular location with regard to hiding the particular Folder. Then if you intend to Shoes the particular directory then click on the particular directory choice with the control panel or perhaps with the MY Laptop or computer Option. Then have click on the particular Exhibit the particular undetectable directory and click on the particular utilize choice and then finally click on the particular OK option. Now the File will get appeared. Go to your file(which you have to hide) Right click on it. Click on Properties < General. Tick on the Hidden and apply to hide. To show the hidden file or folder. Go yo START MENU< CONTROL PANEL< APPEARANCES AND...< FOLDER OPTION. In the FOLDER OPTION click on VIEW. Click on SHOW HIDDEN FILES,FOLDER, DRIVERS. To unhide select the option disable and then click on Ok.
Click on Folder and Press Alt +Enter..
Now put check mark on Hidden button..
Click on apply and OK..
then click on Organize button..
Then select option show hidden files or folders..
after selecting click on apply and ok..
***********At first open drive . ***********After it press CTRL+ALT options . ***********Now here menu open and select tools options. ***********After it click on view options. ***********Now here select folder options. ***********If you want to show hide folder then tab on show hide folder . ***********Otherwise you can tab on hide folder options. ***********Now on this way you can perform hide and show operations. How can I make a new drive by reducing the space of an existing drive in windows 7?